Car collisions are sudden. They happen in the middle of a tranquil, uneventful drive. That quick minute can result in minor injuries or tragic fatality. Once you are safe from the immediate harm of the accident, shock can quickly set in. It can be hard to think or understand the gravity of the situation. These may be some of the most crucial moments in the life of your personal injury lawsuit. This is why it is important to take pictures of the vehicle, the surroundings, the people, even your clothes and skin. The American Association of Justice reports that insurance companies are very profitable. They are so profitable because they can be incredibly successful in denying accident claims. Your photos will back up your words. 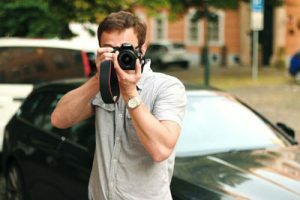 Without your photos, it becomes easier for an insurance adjuster to put the culpability of the accident on you, low-balling the cost of the damage, and arguing that your injuries are not that severe. Pictures from the area of the car accident will depict the immediate damage that was caused, and how it was caused. Photos of the exact state of the vehicles immediately after the crash will reveal whether it was a T-bone or head-on collision. Marks and debris on the road, depicted in a photograph, assist in these determinations as well. What the car looks like after an accident, or how it happened are not the only clues provided in photographs. Documenting your immediate injuries would be a crucial use of photography. These include photos of cuts, blood stains, burns, scrapes and any other injuries. Documenting how the injuries heal, or injuries come on (such as bruises) will be important towards proving pain and suffering. A car accident victim can face medical and miscellaneous costs nearly $200,000 in any one scenario, according to the National Highway Traffic Safety Administration (NHTSA). The astronomical costs are compounded if the injury is a type that will need continuing therapy. The financial incentives for documenting all the evidence you can via photograph is important to remember. If you are injured as the result of a car collision, call the Law Offices of Jeffrey S. Glassman at (617) 367-2900.